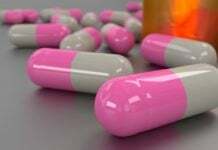 Benzodiazepine prescription practices may be in response to an epidemic of distress, rather than being used to treat specific mental health diagnoses. A new study, led by Donovan Maust, geriatric psychiatrist, researcher, and assistant professor at the University of Michigan, investigates geographic and physician characteristics related to benzodiazepine prescribing in Medicare beneficiaries. The results of the study, published in the Journal of General Internal Medicine, suggest that benzodiazepine prescriptions are more common in areas that are more rural and have lower income and education levels. Benzodiazepines were also more commonly prescribed by male providers. Additionally, areas that also had high rates of opioid prescribing were associated with higher rates of benzodiazepine prescribing. “Given the potential adverse outcomes associated with their use—particularly in combination with opioids—it is important to consider whether this variation in BZD [benzodiazepine] prescribing may be contributing to the uneven distribution of gains in or even worsening of life expectancy in counties across the USA,” state the researchers. 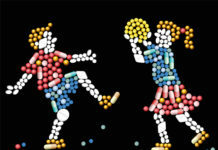 Benzodiazepines can impair cognition and increase the risk of falls in older adults. The authors note, “the extent of BZD prescribing is high given the availability of safer, guideline-recommended treatments like selective serotonin reuptake inhibitors and cognitive behavioral therapy.” Only 5.6% of people prescribed benzodiazepines receive their prescription from psychiatrists, meaning the vast majority are prescribed in primary care. 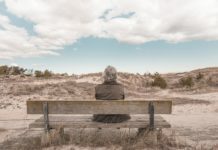 This is especially true for older adults as psychiatrists are less likely to accept Medicare compared to other specialties. The researchers discuss that benzodiazepine prescribing is usually done without a clear mental health diagnosis, and seek to understand how the geographic region or prescriber characteristics may affect benzodiazepine prescription practices. “If mental health disorders are not fully driving BZD prescribing, more extensive BZD prescribing in socioeconomically distressed counties might suggest that this distress—rather than a clinical indication such as panic disorder—is driving potentially inappropriate prescribing,” state the authors. The researchers reviewed the 2015 Medicare Part D Public Use Files, Area Health Resources Files, and County Health Rankings for information on prescription practices, patient demographics, and physician characteristics. 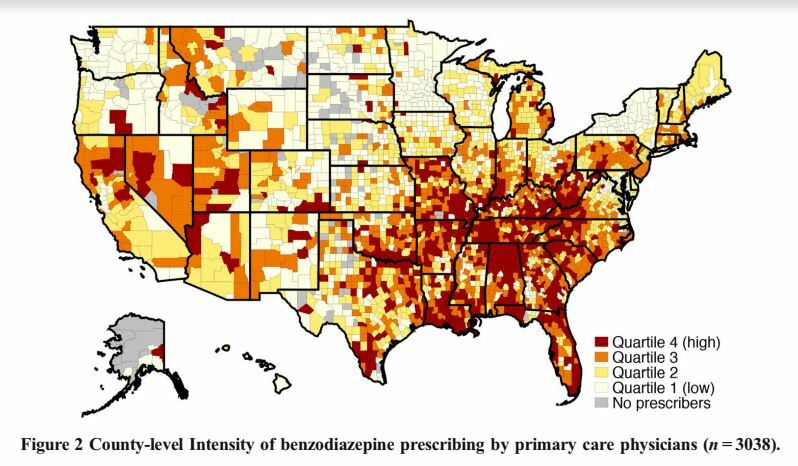 The researchers calculated the intensity of benzodiazepine prescribing within a county based on the percentage of days that benzodiazepines were prescribed by the county’s primary care providers (PCP) out of the number of days that all Part D medications were prescribed. They also calculated the intensity at the PCP-level (i.e., the percentage of days benzodiazepines were prescribed out of total days of all Part D medication were prescribed by an individual PCP). Results show, “Medicare Part D beneficiaries were dispensed over US$374 million worth and 1.2 billion total days of BZDs, which comprised 2.3% of all Part D medication days.” PCPs were responsible for 62% of all benzodiazepine prescriptions. States with the highest county-level prescribing practices were Louisiana, Florida, West Virginia, Tennessee, and Alabama. Higher intensity counties were more rural and had fewer primary care providers and psychiatrists per capita. Counties in New York state had some of the lowest intensity prescribing practices for benzodiazepines, with all but three counties being in the lower quartile (i.e., the bottom 25% of counties). The authors highlight that New York initiated a strict benzodiazepine prescription policy 30 years ago, and suggest this policy explains the lower-intensity prescribing. “In the final model, several other concerning county-level health status characteristics were associated with high-intensity BZD prescribing, including more days of poor mental health, a higher proportion of disability-eligible Medicare beneficiaries, and a higher suicide rate,” write the researchers. At the PCP-level, female providers were less likely to be high-intensity prescribers. More years in practice was associated with higher intensity prescribing. Having more patients who are white or receiving low-income subsidies was also associated with higher intensity prescribing while having older patients was associated with lower intensity prescribing. The most influential single factor associated with high-intensity benzodiazepine prescribing was also being a high-intensity opioid prescriber. The authors expressed concern for the possibility that some PCPs may be prescribing both benzodiazepines and opioids to the same patients but noted that they did not have access to patient-level data and therefore could not determine whether this was the case. Additionally, prescribing antibiotics and prescribing for the elderly at high intensity were associated with high-intensity benzodiazepine prescription practices. Just now in PMQ’s Mrs May said they hope to introduce legislation on the back of the Simon Wessely MH review and they (Tories) all congratulated him. Charles Walker, Conservative: “Mr Speaker can I thank my friend for her determined campaigning in the area of mental health. Theresa May replied: “How we look at mental health will unite people across this house and I congratulate the work done by Mr Wessely. Thanks to Auntie Psychiatry for that! Sir Simon Wessely on the R4 today program today 7.55am. He qualified that by saying probably because of discrimination in childhood, yes Sir Simon and that includes by psychiatrists and psych workers in adulthood. Yes indeed anything you do is now ear marked for a MH label. Psych is now being expanded and marketed ever more and needs to clearn up it’s act.. This is what it is all about. Making psychiatry acceptable. A mental hospital is now a ‘place of safety’ and ‘supported’ housing. The public should not be fooled. so…poverty and old age and disability create extreme states, extreme states in low status people result in benzodiazepine prescriptions, and then drug-induced misery is added to the mix? Awesome. Poor people are more likely to seek a prescription just to sell it. Mrs May… her voice sounding shaky in interview on R4 Today program. Oh my could she be out before the vote on 11th december if she doesn’t compromise… will/can they get rid of her before next Tuesday ? This is what struck me from Simon Wessely. Does anyone here think psych drugs ‘help restore health’ ? I’ll grant one thing… a benzodiazepine can help calm a person in the short term. NOT until psychiatrists with power such as Simon Wessely admit that psych drugs are killer drugs indeed cause the very condtions that make people suicidal and violent (akathisia/toxic psychosis) will we see any really change in all this abuse. Fascinating map – somewhat similar to those showing opioid abuse, poor diet/obesity, loss of good rust belt jobs, high number of evangelicals, and so on. I wonder if the industries supporting the above (BigPharma/BigMac/Walmart, and so on) actually collude.